National Service N/S No. 2/758609 14 Aug1956 Discharged 14Aug1960. Date of Discharge; 16 Oct 1945. Sadly Charles is no longer with us. Special thanks to Peter Kong for permission to include his father’s details. Enlisted and discharged four times (twice medically) between 26th October 1960 and 9th October 1968. First enlisted 26th October 1960 – 19 Coy RAASC – Ashfield Depot. Finally Discharged 9th October 1968 – 3 Coy RAASC – Ashfield Depot. Awarded Australian Defence Medal – February 2007. 3 Transport Association – Vice Present 2001 to present (2009) – Secretary 1999 and 2000. Delegate to the Anzac Day March Committee 2008 -2009. Sub Branch Delegate to State RSL Congress 2007, 2008, 2009. Sub Branch Alternate Delegate WMDC 2008 and 2009. 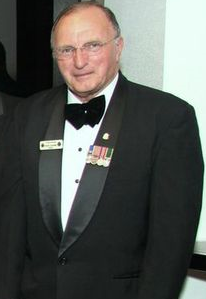 Ashfield RSL Club President 2003 to present (2009) – Director 2001 and 2002.